There are many cake flavors out there and Red Velvet is one of them. If you want change up the White, Yellow, and Chocolate flavors, try this Red Velvet recipe. Preheat the oven to 350 degrees and line a 18-24 cupcake pan with cupcake liners or grease and flour without liners. Let the margarine and cream cheese soften to room temperature. Cream well. Add the sugar, and beat until mixed then add in the vanilla at the end. 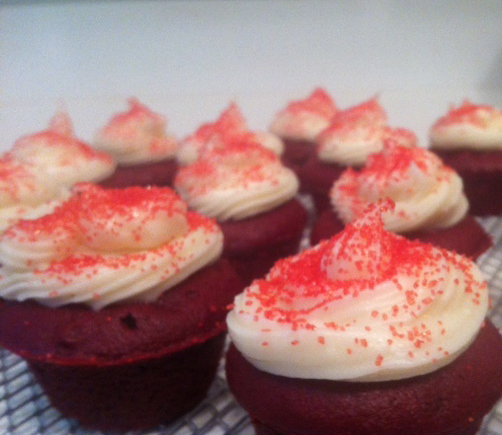 Apply the cream cheese frost ion to the finished cupcakes then sprinkle with red colored sugar.